Program directly off a solid model. CNC Software, represented in Australia by Technology Sales and Support , has released Version 9 of its Mastercam Lathe software offering new features and improvements for effective turning. The improvements come from new programming strategies such as smart toolpaths that transition between various types of cuts and toolpaths within a single process. An operator using Mastercam Lathe V9 can now program directly off a solid model eliminating the need to convert or define edge geometry on a solid. In Lathe V9, many small new features build upon each other resulting in another big step forward in turning efficiency. Examples include the ability to click and drag the start point to anywhere on a contour, and more flexible roughing overlap control. Tapered thread programming is improved, relief groove creation for threading is enhanced, and expanded stock definition helps ensure precise programming. "Suface finish is another crucial element that we address in more depth with Lathe V9", says CNC Software president Mark Summers. The operator can now automatically set feeds and speeds by specifying the required surface finish quality in microns. Lathe V9 can automatically create a finish pass after a rough operation using the same tool, break corners during finish passes without changing the model and run a finish pass after creating non-rectangular grooves. Part visualization is also streamlined. For instance, a shaded view of a cut part can be seen as toolpaths are created and, at any machining stage, a 3D solid or surface model of the part can be viewed or saved. 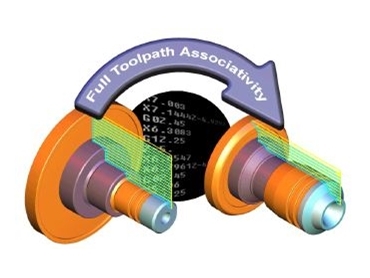 This is in addition to Mastercam's highly regarded on-screen toolpath backplotting and solid verification. When combined with Mastercam Mill, the new benefits of V9 Lathe can be applied to enhanced C-axis (Mill/Turn) programming. This advances performance in contouring with three dimensional or flat geometry. Advanced Face and Cross drill features include the ability to sort points in a clockwise or counterclockwise sweep. It automatically sets tool plane and construction plane for contour and drilling operations.